The Nightclub, a nomadic platform that since April 2012 has created a dialogue among diverse artistic practices and practitioners through curated exhibitions presented in various venues for one night only. The project has been shaped by exhibitions, talks, and happenings organized by Miami’s close-knit network of artists and cultural producers. 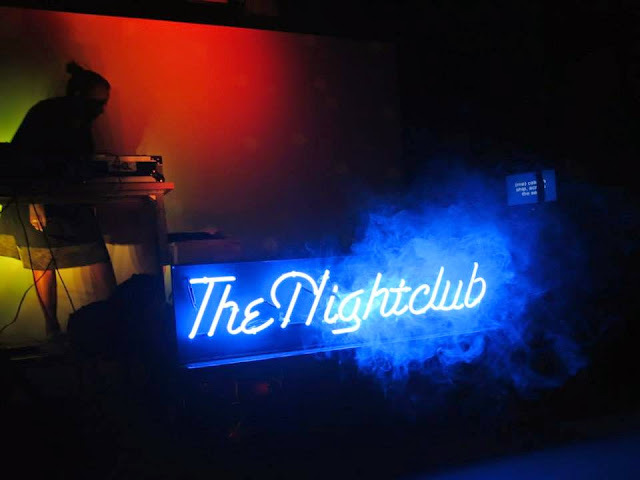 The Nightclub proposes a model of operation and connectivity. It is a sample of an organization, a sample of ephemeral production, a field of research, and a case study of each edition. It creates a process of connections, a rhizome. The challenge has been to fit both personal needs and the intentions of the collaborators into one space, while trying to build a collaborative and dynamic format. It has tried many possible solutions in the face of all kinds of issues related to production management, personal relationships, leadership, conceptual bases, and communication, among others. It has been a good way to face traditional terms of display and inflexible institutional structures, and to try new systems of making knowledge. The Nightclub offers complete liberty in terms of artists’ participation and the type of work they propose, which in this case meant serving as curators and casting curators in the role of artists. The restriction is that each event lasts only four hours, a single night. It's completely ephemeral and nomadic—never the same and never in the same place. The neon sign has functioned as a corporatization and marketization of the artistic field. It is an object that absorbs any space in itself. The integration of this object–the neon sign–in the realm of an art exhibition empathizes its invasive and appropriative nature to transform and evolve its surroundings. The sign, as an artifact, carries with it the history of all the venues in which it has been part of but also the semantics of its own name, The Nightclub, implies an entertainment venue, which usually operates late into the night. By locating the sign in a particular space, it attempts to absorb as part of a venue whatever interaction happens in the facility during those four hours. The Nightclub sign acts as a container of memory and a model of adaptability. Within each photograph included on the proposal, there is a representation of the performative elements and vessel of ephemeral actions. The program includes the NighTalks, a series of conversations on the here-and-now of the arts by Miami-based and visiting thinkers.